Non-medicinal ingredients: tocopherols, sunflower oil, coconut oil, gum Arabic, sucrose, starch, tricalcium and dicalcium phosphate, rice extract, sodium ascorbate, sodium stearyl fumarate. Capsule: hypromellose. Pro Bones contains all of the essential nutrients required for building healthy bones, including: calcium, vitamin D, and magnesium. 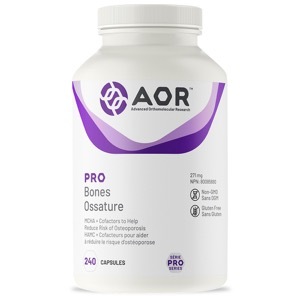 Pro Bones may benefit people who have osteopenia or osteoporosis, or are at risk for one or both of these conditions. Pro Bones increases bone mass, improves bone growth quality and reduces the risk of fracture. Additionally, MCHC is the best source of calcium for bone building and maintenance. It can not only slow bone loss, but can actually halt and reverse it due to the proteins and other nutrients naturally found in MCHC. It also contains manganese to ensure the proper function of bone building cells, vitamin K to regulate calcium and keep it within the bone, and glucosamine to produce building blocks that are used for joint and cartilage repair. AOR's MCHC is derived from the purest New Zealand bovine bone. In accordance with the latest research, Pro Bones also contains both MK-4 and MK-7 as sources of Vitamin K2. A vegetarian glucosamine sulfate has also replaced the shellfish-sourced glucosamine HCl, making Pro Bones shellfish-free. Adult Dosage: Take up to 6 capsules daily with meals. Take a few hours before or after taking other medications. Caution: Use caution when taking blood thinners or if symptoms worsen. Some people may experience diarrhea. Contains soy.